At the very outset, I would like to congratulate Shri Khamliana and Shri Mohammad Abdul Bari and the Foundation for Amity and Solidarity, New Delhi. 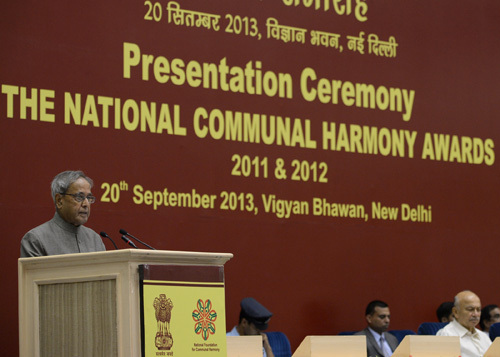 The National Communal Harmony Awards conferred on them today are a recognition of their outstanding efforts in promoting communal harmony in our country and in strengthening national integration within its diverse peoples. Harmony and tolerance are at the very foundation of the Indian ethos, our tradition and our history. In the Rig Veda itself, it has been so simply yet profoundly enunciated that "The truth is One, the wise call it by different names” - "Ekam Sat, Vipraha Bahuda Vadanti”. It is due to this legacy, that India embraced and assimilated, as her own, the various religions, reform movements and waves of renaissance that have swept our consciousness over the centuries. So dear were these ideals to our Founding Fathers that when they framed our Constitution, they drafted a specific provision in this regard. Thus, our Constitution lays down the fundamental duty of every citizen to "promote harmony and the spirit of common brotherhood amongst all the people of India transcending religious, linguistic and regional or sectional diversities”. However, despite this sacred mandate, despite the Directive Principles of State Policy and despite the safeguards that our laws provide, despite all the measures taken by our Administrative machinery, why is it that communalism does not seem to go away from our society? Why is it that we do not learn the lessons from our own history but keep repeating the same tragic mistakes? None of our institutions preaches hatred. No religion preaches discord. On the contrary, they prescribe that it is the moral duty of every individual and of society as a whole, to spread peace and amity. What can we do to uphold and implement this? How can we be more vigilant against negative forces and successfully thwart their nefarious designs? The strength and resilience of Indian society lies in its plurality and diversity. This unique quality has not been imported from anywhere nor has it come into our society by accident – rather it has been consciously nurtured and nourished by the tolerance and wisdom of the Indian consciousness. These principles are at the very foundation of our secular fabric. And, although maintenance of social peace and harmony is a function of Government, this responsibility cannot be delinked from the duties of each and every individual citizen. The distinguished awardees who we felicitate today should be emulated. We should strive to complement their achievements with our own individual and collective efforts. Each one of us must think of our own personal contribution to peace, harmony, amity and accord in our respective spheres of activities. Dialogue never fails to create a confluence of the streams of diverse thought, opinion and aspirations. It coalesces and synthesizes the currents of vibrant cultures, religions and civilizations. It is, therefore, important to recognize and salute those among us who promote these methods and fight with courage against the forces of obscurantism, extremism and militarism. Eternal vigilance is a shield against those who harm the unity of our country. We must heed the words of the Father of our Nation who was pained by communal strife and observed "the lawlessness of communalism is a monster with many faces: it hurts all in the end, including those who are primarily responsible for it”. These values must be inculcated from a very young age. Gandhiji firmly believed that the key to the solution of the communal tangle lies in everyone following the best in his own religion and entertaining equal regard for the other religions and their followers. I commend the Ministry of Home Affairs and the National Foundation for Communal Harmony for instituting these awards. Once again, I extend to the award winners and also to all individuals and institutions in the different parts of India engaged in building communal harmony, my heartiest appreciation and good wishes for the success of their work. To them I say, God be with you.